In this study, the densities, excess molar volumes and partial molar volumes of four binary systems containing N,N-dimethyl acetamide (DMAc) with 1-alkanols (1-butanol up to 1-heptanol) are measured at 298.15 K. The results showed both constructive and expansive excess volumetric behavior for studying binary mixtures. 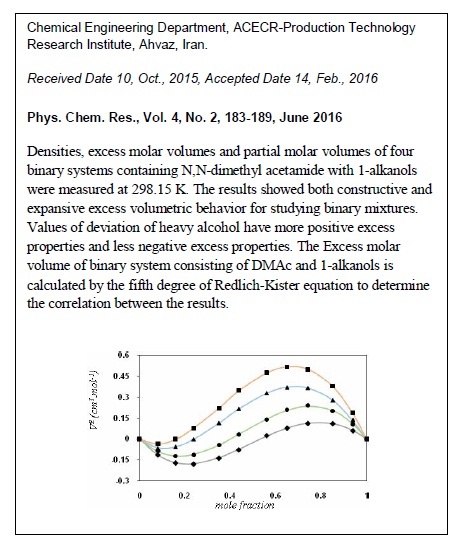 Deviation values of heavy alcohol have more positive and less negative excess properties. The excess molar volumes of binary systems consisting of DMAc and 1-alkanols are fitted by the fifth degree of Redlich-Kister equation, and resulting coefficients have been calculated.